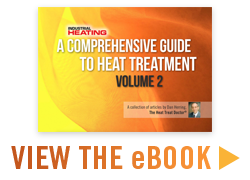 Industrial Heating | Thermal processing technical journal covering heat treating, & ferrous & nonferrous thermal processes in excess of 1000 degrees F.
The AV450 Automatic Vision System allows users to cost-effectively achieve high throughput in their inspection process. The LS series of dry screw pumps is a more compact and lower-cost replacement to multi-stage dry Roots pumps for a wide range of vacuum applications. Scibond SL-87 is an environmentally friendly blend of water-based polymers that is applied as a coating, rather than a reactive bath like zinc phosphate. A horizontal forging reciprocator features Spra-Rite technology. The R10 series of fixed infrared sensors is designed for use in OEM equipment and industrial process control and monitoring applications.